Khenmo was an esteemed Professor of Sculpture at the University of Maine and at the Maine College of Art in Portland, ME before becoming a Buddhist nun. Throughout her distinguished academic career, she received numerous awards and prizes for her work. She has a MFA from the University of Pennsylvania and 20 years of teaching experience at a college level. 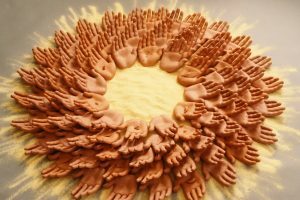 She is a breast cancer survivor, who served as an Art Fellow at the Connecticut Hospice and board member of the Addison Respite Care Home in Vermont and Maine Respite Home where she started an arts team for hospice volunteers. After studying Buddhism for 15 years, in 1995 she made a pilgrimage to India, residing at Namgyal Monastery studying Tibetan, Lam Rim texts and sand mandalas at the Tibetan Library of Works and Archives initially for 3 months. returning again the following year for another 5 months. In 1997 she took Novice ordination with HH Chetsang Rinpoche. She then received the many cycles of Drikung empowerments and lungs over a period of many annual trips to India. She also began her retreat training with a 5 month solitary retreat in the mountains of Almora, India at the Drikung three year retreat center. This retreat practice became a way of life with annual solitary retreats. In 1999 she entered intensive monastic Nova Scotia for training at Gampo Abbey learning the monastic rituals and duties and studied with Ven. Pema Chodron. She spent the next two years in shedra studying Buddhist classics of philosophy including the Abhidharmakosa, Dudra, Lorig, Tarig The Bodhisattva’s Way of Life, the Uttara Tantra, Tenet systems, classical Tibetan and debate. 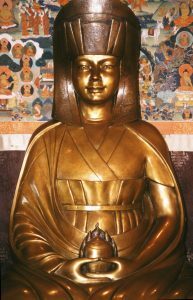 While there she created a bronze statue of Gampopa for the Abbey Stupa and directed monastic training. She then supervised the building of a Peace stupa in Vermont. In 2002 Khenpo Drolma was invited to come to India to fulfill the vision of HH Chetsang Rinpoche, to make a statue of King Songtsen Gonpo based on a dream of the 10 th Panchen Lama. 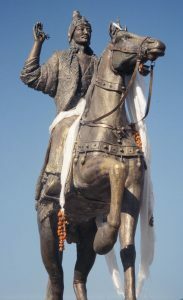 This statue originally was to have been installed in the main square of Lhasa, Tibet; but due to the invasion of China all plans were abandoned. She became the Art Director for the creation of all the art works for Songtsen Library. To actualize H.H. 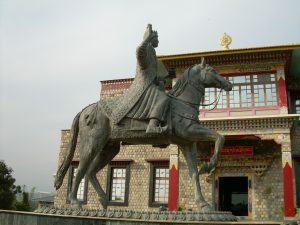 Chetsang Rinpoche’s artistic vision, Khenpo Drolma led an international team of 16 artists in creating 40-ceiling thangkas, an elaborate two story entry door and numerous statues using traditional Tibetan techniques and materials dating back to the 1500’s. Khenpo Drolma, aware of the significance of the statue and importance of historical accuracy of the depiction of King Songtsen Gampo researched details in the great libraries of India to document 7th century fabric, clothing, jewelry and horse harnesses. HH Chetsang Rinpoche encouraged Khenmo to take full ordination as a bhiksunni in Taiwan at the Ji Yu Chen Monastery, becoming the first fully ordained nun in the Drikung Lineage. 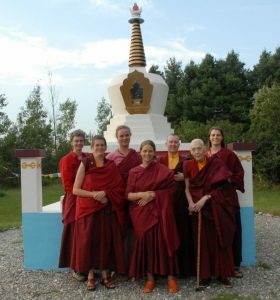 Khenmo returned to the US to begin working on establishing Vajra Dakini Nunnery. 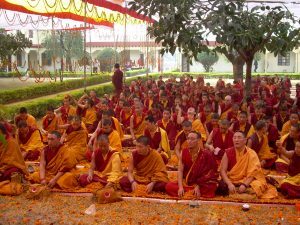 In 2004 during the Drikung Monkey Year Teachings in Lumbini, Nepal she was installed as a Khenmo in the Drikung lineage, becoming the first westerner to hold the responsibility of abbot.